The Sidekick-Tracker-Vitara, cab heater issues ? WHY IS Cab heat DEAD? or? See Cross links to related topic. 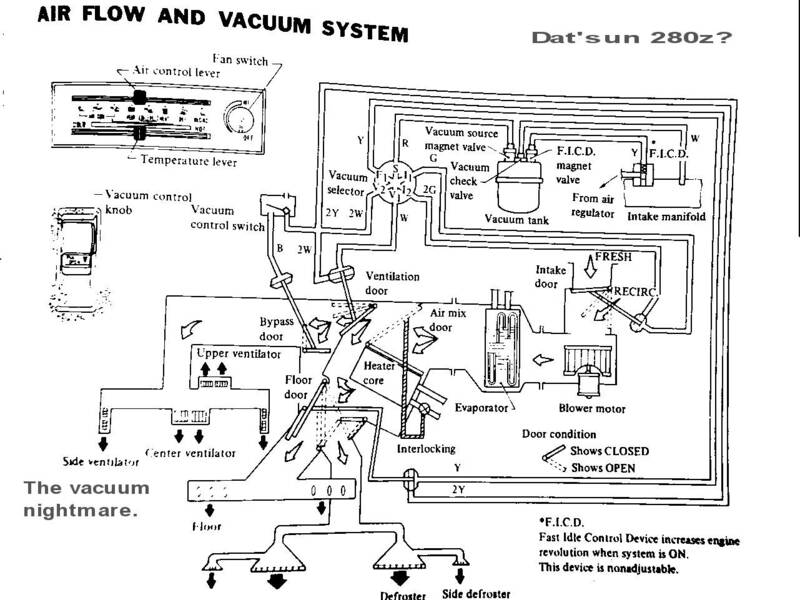 A/C page shows schematics for heat too. Overheated, and some dude removed the Thermostat? See my Frigid engine page, all ways to get too cold. The Fan is dead totally or just some speeds. See dead fan below. The heat only comes out some vents. (bad damper) this car uses only cheap and 100% reliable cable controls on dampers. No freak'n, $150 damper motors or very hard to diagnose VACUUM SERVO'S. I have no cab heat, or is very poor. If the thermostat is bad, wrong temperature rating , backwards (upside down), or the system is full of air, there will be no hot water. No hot water?, means NO JOY ! The thermostat must be stamped, 189/192/195/200F Nothing lower ever. The Engine coolant must attain (reach or exceed) and hold at 180F (see stamp on lip of thermostat actual) (hold not fluctuate) Newer cars are near 200F. 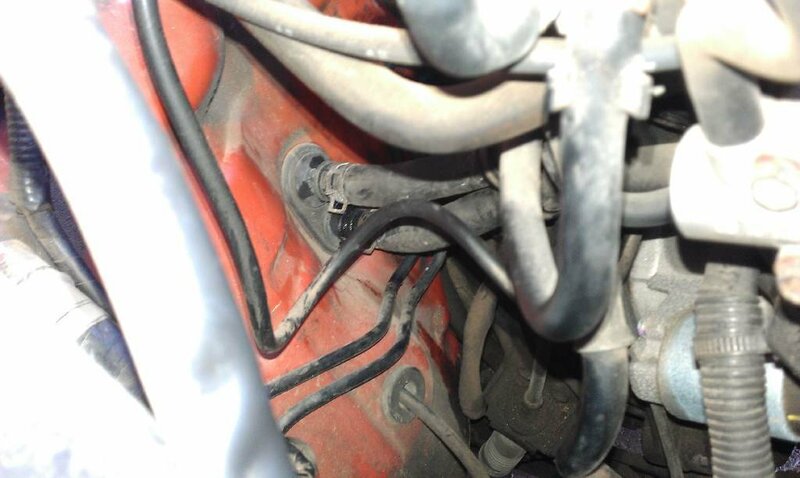 Some cars (not this car) have a water valve on same hoses, just before the firewall, does moving the blue-red (cold/hot) lever in the dash, open and close this valve?, if not, the cable is broken, (or the nasty old vacuum servo's dead on other brand cars.). 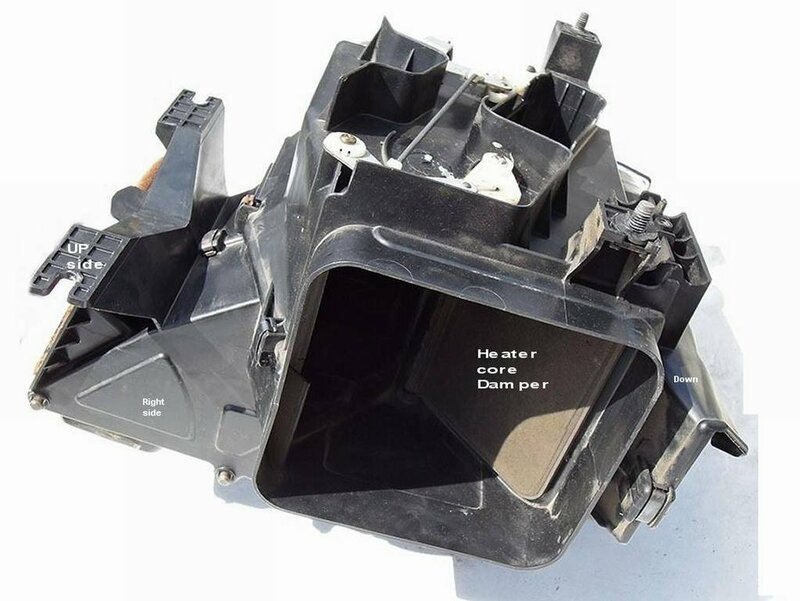 On newer cars, they have 1 to 4 damper motors, that is, true electric motors ,they can fail, and you will need a schematic or FSM to trouble shoot them (or alldata.com). The FSM tests are unique to each car , make, and year. On this car, there is no hot water valve. 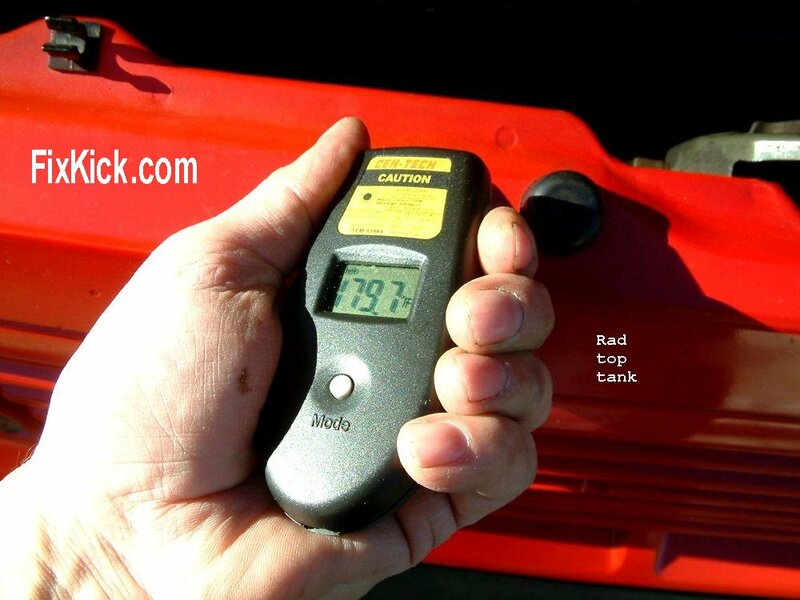 The core runs hot all the time, and only the blocking doord, called a damper , allows heat flow, this device is just a lever on the side of the heater core box. make sure when you move the heater blue-red (hot/cold) lever, that this cable moves this damper. In fact, make sure all cables there, move there end piece cams , and moves fully from end to end. (play with the controls, and watch the cables end to end, to the all work and do their jobs.? 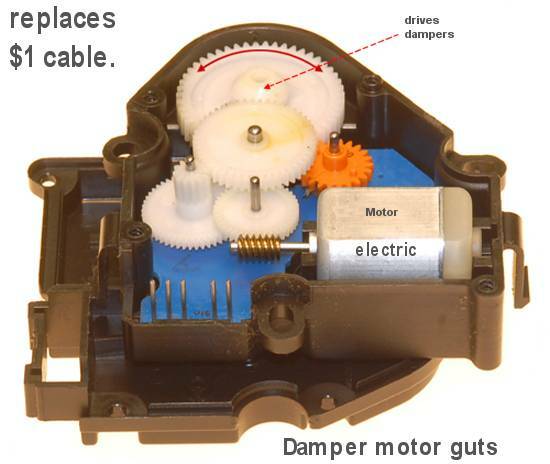 So simple this is, compared to motor drive dampers. If the cable sheaths, are not clamped down, the cables are rendered useless, clamp them now. They must now be adjusted, if this was bad. (broken clamps) Adjust for full controls end to end. Just like a bicycle brake lever. Use tie wraps to make your own clamps? Now, air might flow through the core, some cars (many)( leaves fall inside (pin needles?) 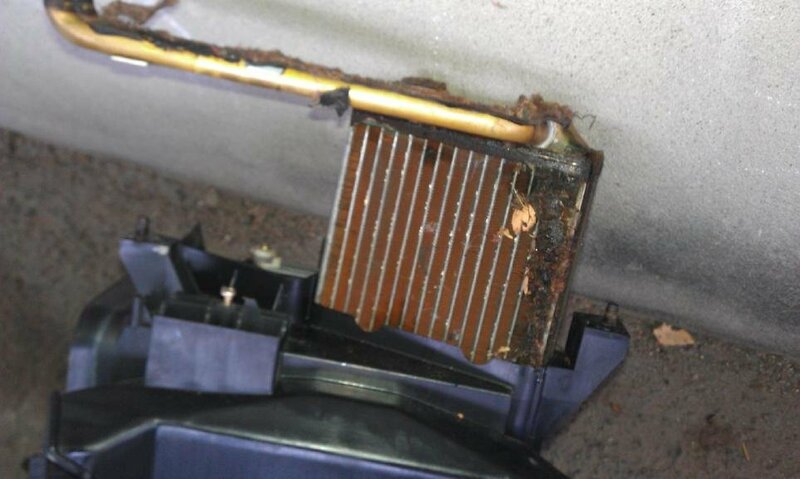 down the cowl vent intake and pack the heater core full of this trash, you will have to clean it. THE CORE PULL, SLIDE SHOW. Keep in mind on the old cars, you can at anytime move the dampers by hand, disconnected. proving the door is opened, by HAND. This be first, before pulling any heater casing, for sure. HVAC systems can have 1 motor or 3. Some are a mix of damper motors and cables and vacuum servo's , some car makers call these, Electric damper Acutators. A fancy name for a motor and cheap plastc gears inside. The bad news is each brand of motor works differently and eash have a very UNIQUE TEST, detailed in the FSM. Starting in 2003 the Grand Vitara, has the new 3 mode actuator motors and an electronic controller to make it all work. The 04 Vitara uses 2 cables and this motor (see test here). Get your FSM , buy it and read the HVAC sections for your car. FSM = Factory Service Manual, as sold at your dealer or used at fleabay. (or Helm.com) Suzuki's are here, at pitstop. < click me to zoom. Be happy, your old Suzuki don't have these expensive and complex motors above. Note , the easy to break plastic parts, inside?...... (have a deep pocket, ready) Over $100 a POP ! Coolant in cab heater is not flowing. Back flush it. ( feel the hoses to it, both must be as hot as radiator) Heater valve on other cars, stuck , bad or clogged. Heater flap , stuck closed, cable fell off , operating lever. Cable clamps missing or loose. If heat only works in circulation mode, then the fresh air vent is blocked at ANY POINT. Leaves in cowl tank air plenum, rodent nests, etc. or its flap is busted. If engine dont' reach proper temperatures then you have and engine over cooling failure. 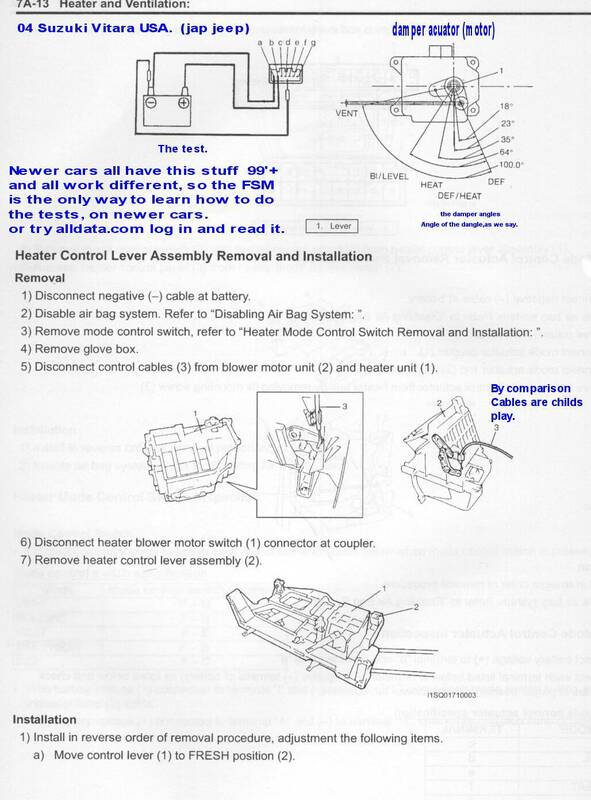 If the engine is fully hot, and those heater core 2 hoses are hot ( 180F+) AND the fan is running at full speed on high, cap is still frigid?, then the heater flaps are jammed closed. See all damper flaps here. The old Suzuki has no water valve (heat lever) it has a flap that blocks or allows air to pass through the core , so the water flows through the core 24/7 (always ) Flaps, doors, dampers all are same meaning. If the fan is dead ( or one speed is dead) (heater fan in cab) then check the heater resistor block. Seen here. Resistor Block? : Remove glove box door ,2 screws, see that resistor ( it's air cooled) and a bad resistor ( they are a naked type) will be blown to bits. (gone). Now we are at the last point, The core is hot, the engine is hot the flaps are open the fan failing, (whole or in part ,fan fail). THE CORE PULL, SLIDE SHOW. THE FAN SWITCH and speed limiting resistor block. We now have a bad fan switch. My 97 Heater switch was warped bad. by the heat of the Sun. Cooked it to DEATH and almost all Sidekicks this year , are failed or about to. The side clips warped (pop) and can no longer retrain the switch guts. Pull the battery minus lug. Pull front bezel off HVAC center console surround , it just pulls out. By the way, HVAC, is Heating Ventilation and Air Conditioning. Remove lamp pod , from bezel. Remove the slider surround plate , 4 screws . The slider mechanism and the switch are in clear view. I can pull the control pod just enough back to un mount the switch and its elect. plug. Buying the Suzuki switch ? are you? good luck there, I'm told that the last year for buying just the switch is 1991. ( sadly) ( poor service? at Suzuki?, any wonder they chapter 11?) IMO ! now shutting down in Canada. I can clean my switch and file the contacts. Do not lose the tiny steel ball and spring, or all hope is lost. Find a room with no rugs or floor drains and take it apart. << hint. CAMI is Canada plant (shut down), Japan is the Iwata JAPAN plant made. You VIN code tells you which MFG plant the car was made. 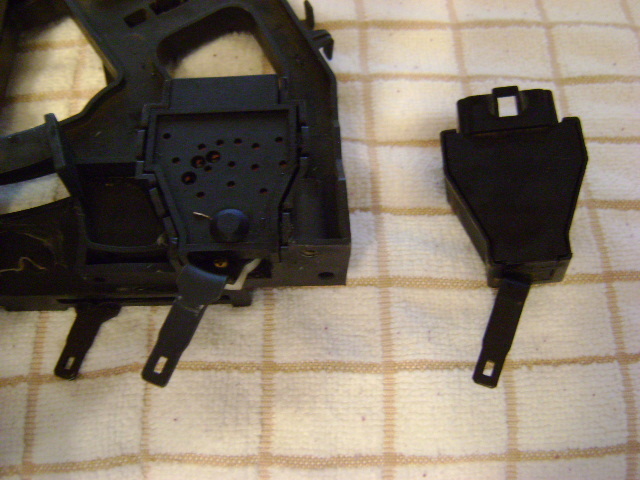 Do not remove switch internals in the car, go to a place you can find the parts that fly out. 1 spring , contact and a tiny ball bearing inside. Don't lose them. Photo 1: Whole Switch out, internals, in place and a spare to the right. Below is 96/97 in 1998 pushbutton option was added., below has snap out switch. In 1996 the switch is part of total assembly and not sold seperately. (not up to now). So will be expensive. $120 or so. But ACdelco has one for $50 and so does, SMP SM404. The switches vary by if A/C is present or not, year, and what factory PLANT made it. The Suzuki switch is Discontinued. As is the total assembly seen below. The GM is still sold. (GEO) 30007405 and 7399. My GEO parts book does not show all versions. of switches. The drawing clearly shows, JAPAN switch is missing. (did suzuki use wrong drawing here?) My guess is drawing is wrong. 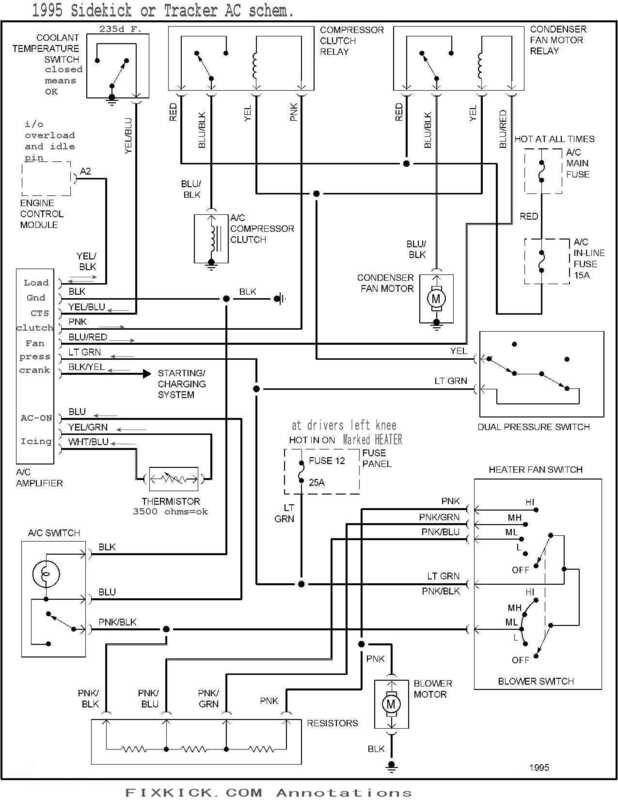 The blower fan switch for 89-91 is 37870-60A01, ID 29 below and is missing on the 92-95 same pages, in the Suzuki parts book. part 29 below mates to right side of part 37 above. If found, its more like $38 part, unlike above. The switch is still sold at Suzuki but not the whole assembly 37 above. Rumor has it that the full 96/97 assembly will fit earlier years. Amazon sells it, the one SMP switch assembly. for 92-97GEO Tracker , ACDelco 15-73369, and at $50 a great price. The resistor block is bad if fan ONLY fails below HIGH, There are no RELAYS and the fan always runs on high , if the above switch is good. Remove glove box door to reach the resistor block. The block is sold in almost all autostores, see my buy parts page here. Most wiring looks like this. Typical of all 92 to 1995. see the other generations, here. If the blower is working on high but not other speeds the resistor block is bad (99% of time) if not then the wires or switch is bad, any voltmeter on earth can find this failure ,even a $10 walfart meter. A volt meter finds this failure easy, 12vdc to a dead blower pink wire. is a dead motor. If 12vdc does not reach, the blower motor, then check at switch high pink pin? if this is dead (0v) then move meter to lt-grn wire pin, of switch, if dead ? (0v), then the fuse is blown or that wire is cut , check for 12vdc on both sides of the fuse 12. if one side is dead, that be a blown fuse. Fuses that look blown are. Fuses that look good, can in FACT be bad. 1989 Iwata -60A10 (early year in japan made) not in stock . 92-95 Iwata 64A11 (says with motor, ouch) (SMP clone HS404) Amazon ? Buy them (stocked) at the 4 links shown here, called Dealers list. GM may sell them (Geo Tackers) see 1995 LSI example here. CAMI is the Canadian Assembly plant (GM/Suzuki owned) (now 100% GM , Suzuki , no longer makes cars in CAMI plant ! And in 2012, Suzuki USA is shuting down,here and in Canada, the new car sales, and way less over the counter dealer part windows both physical on web sales.. see actual court doc's here for "chapter 11"